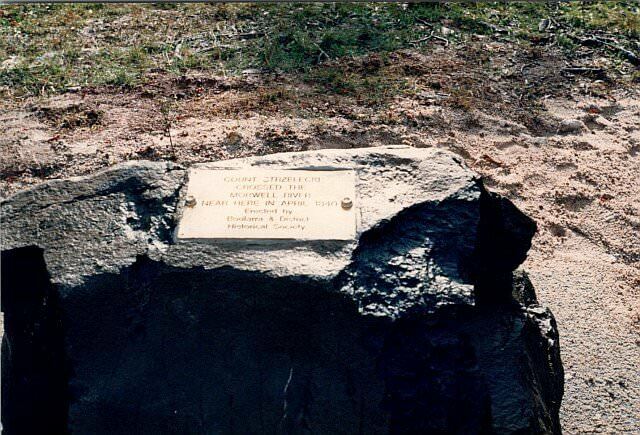 To commemorate Strzelecki's expedition through Gippsland on the route of his southern expedition, which took place between December 1839 and May 1840, seven obelisks and a few simple plaques were created in 1927, funded by local communities. On our site, we reminded you of the existence of the _plaque at Yinnar_ Soutch. We have placed there a small gallery of current photographs made by Przemek Płuciennik from Melbourne. Below we present information, as well as a photo gallery from the unveiling of the Boolarra plaque we received in August 2017 from Boolarra Historical Society. 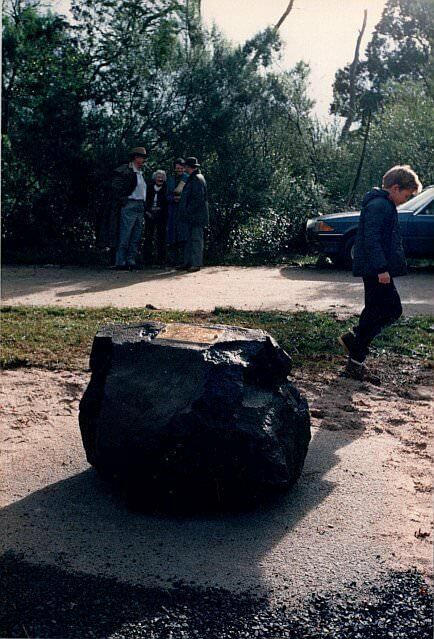 This project was instigated by members of the Boolarra Historical Society in early 1990 which was the 150th anniversary year of Paul Strzelecki’s exploration of Gippsland (now in Victoria, Australia). Boolarra lies south of the Latrobe Valley at the foothills of the Strzelecki Ranges, 20 km south-west of Morwell in the Latrobe Valley, Gippsland. The area was first visited by Europeans in 1840 when the explorer Strzelecki passed nearby It is a small rural town of approximately 600 people in the Latrobe City Shire. In early 1840 Strzelecki left the McArthur property at Tumut in the Monaro district of NSW to explore lands to the south and to establish new areas suitable for agriculture. 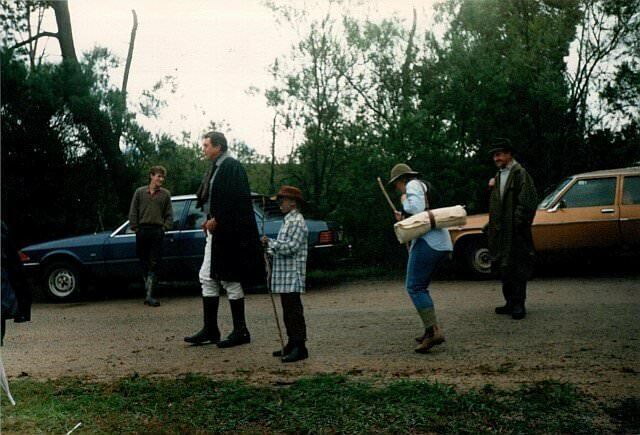 As Strzelecki crossed the flooding Latrobe River heading south to Port Albert on Bass Strait, he and his party found the densely forested hills too difficult to navigate with horses and equipment. He abandoned these - it is thought - near Boolarra. He then changed direction and followed on foot a straight line south west, heading towards Western Port Bay where he knew of an established settlement. With meagre supplies and equipment he and his party made their way painfully and slowly over very rough terrain to Corinella at Western Port Bay. 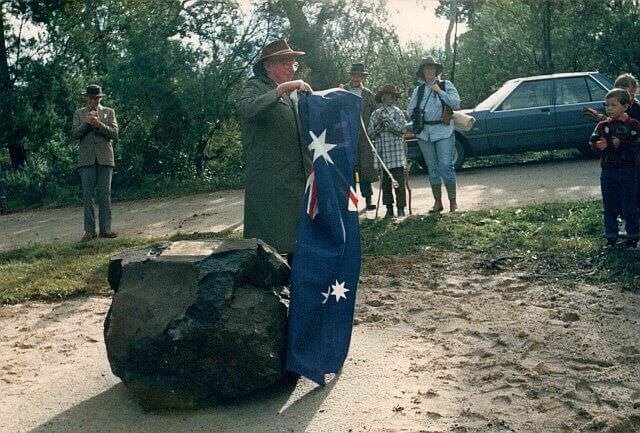 All survived the arduous journey and Strzelecki had the honour of naming this region Gippsland after Governor Gipps. 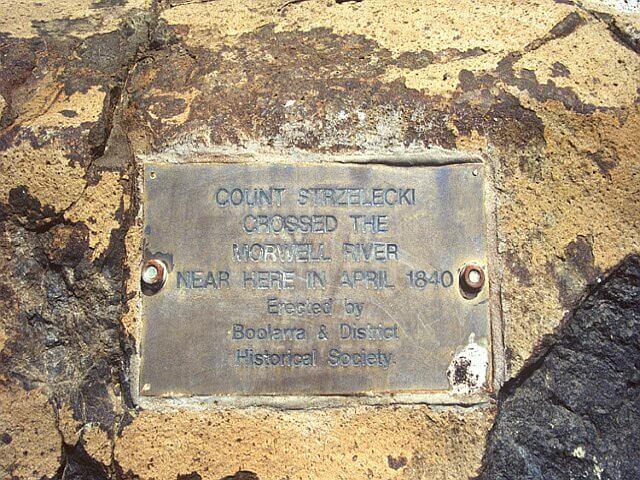 Our society wanted to acknowledge the achievements of Strzelecki and we placed a rock with a plaque to this effect on the banks of the Morwell River just east of the town. 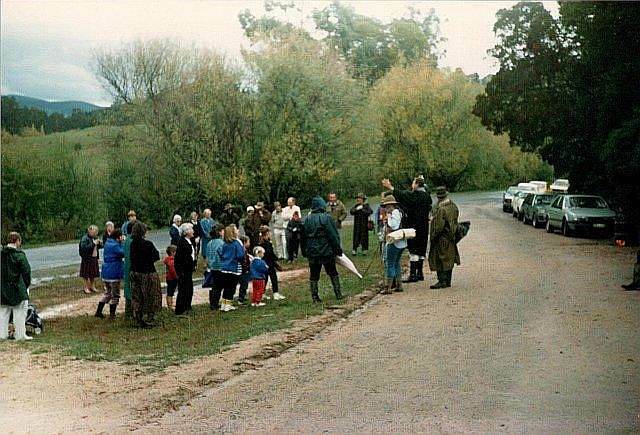 On April 29, 1990 we held a small re-enactment of the Strzelecki journey with member Derek James acting as Count Strzelecki. 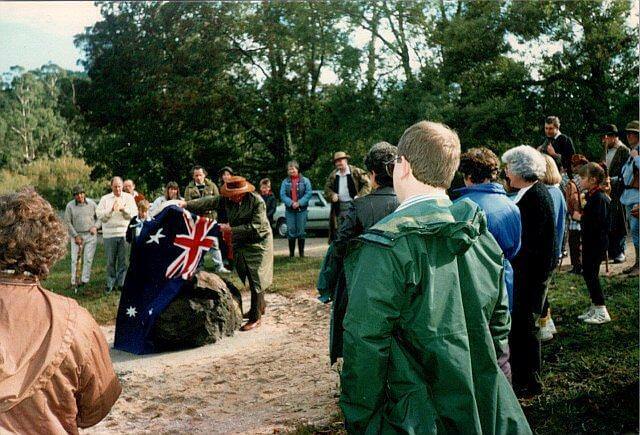 One of our distinguished members, Councillor Tom Lawless, unveiled the monument. 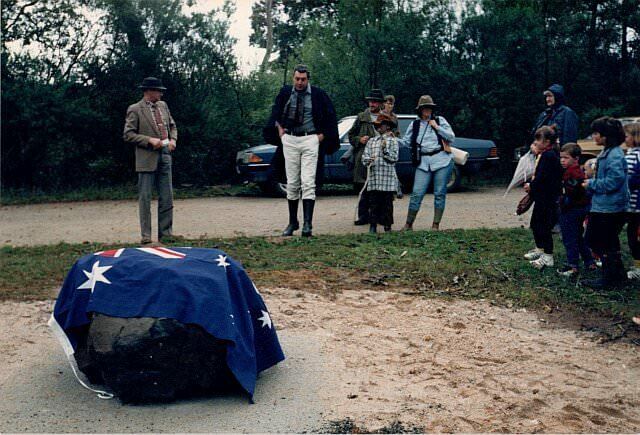 Photo gallery with a _ memorial plaque_ cos2 cos3 cos4 cos5 cos6 cos7 cos8 cos9 in Boolarra. We publish the no.1 photo of the plaque itself with the consent of the Center for Gippsland Studies Federation University Australia. As to whether there are any wild horses from Strzelecki's journey through the South Gippsland hills, it is most unlikely. There were virtually no people there apart from, maybe, small aboriginal groups who occasionally passed through but did not settle. They tended to settle on the coasts or inland plains and lakes. 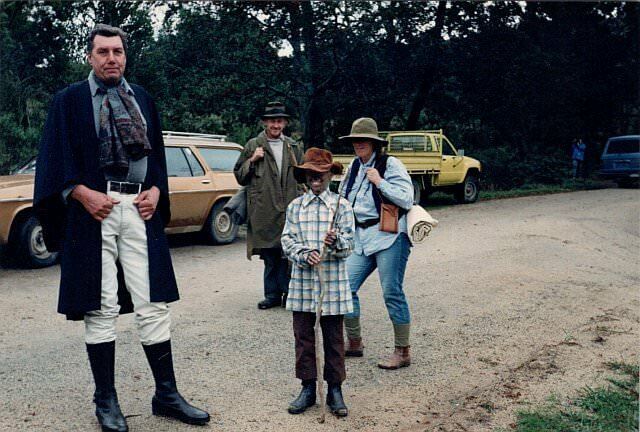 Riley and Charlie Tarra returned by a different route from Melbourne and found their instruments and specimens, and only one horse alive to take back with them. This area was virgin territory in the European sense. 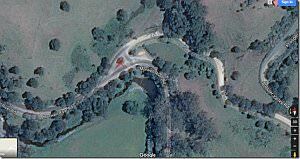 It was virtually cut off from Melbourne by heavily-timbered ranges and swamps. Strzelecki travelled here from New South Wales across the Australian Alps but their provisions were inadequate for such a journey. Also Strzelecki's maps and instruments were not always accurate. Hence it is difficult to plot his exact route through these parts but it is thought he would have crossed the Morwell River near Boolarra when he changed course from a southerly direction to a south westerly one on route to Corinella at Western Port Bay. There are many accounts of Strzelecki's journey but they are mostly speculative. The best is in the „Notes on Gippsland History” by Reverend George Cox, The Anglican of Yarram written about 1912. He had access to letters that Riley wrote to his mother. Reverend Cox had contacted Riley's sister.